What is Juvederm Ultra 3? 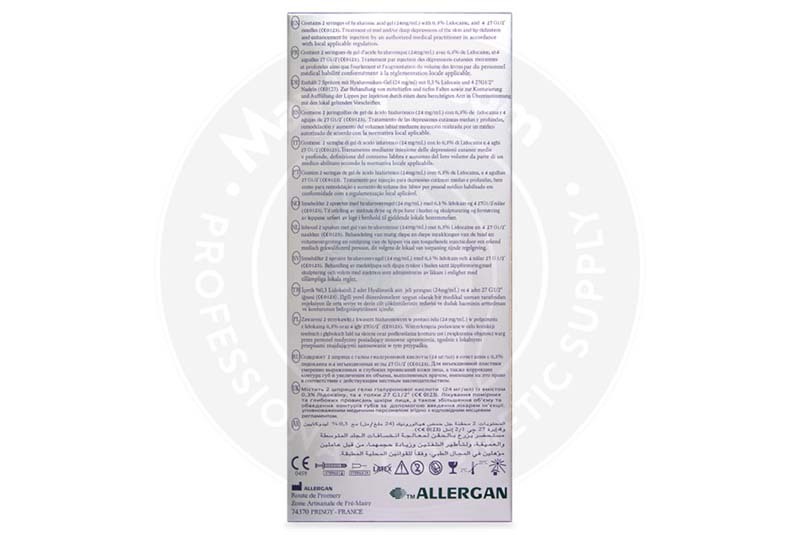 It is an injectable non-toxic, biocompatible hyaluronic acid dermal filler manufactured by Allergan. This aesthetic filler is used to treat deep-set wrinkles and folds as well as sagging skin. In addition, this treatment is suitable for lip enhancement. The added anaesthetic lidocaine works to provide comfort during treatment. The concentrations of hyaluronic acid and lidocaine are 24mg/mL and 3mg/mL, respectively, making the gel more durable. A box of Juvederm Ultra 3 is supplied with 2-1mL prefilled syringe, 1 sterilised 27G1⁄2” needle, instruction manual, and labels to ensure traceability. This fragile package must be stored in a cool and dry place at a temperature between 2°C and 25°C. What is Juvederm Ultra 3 used for? 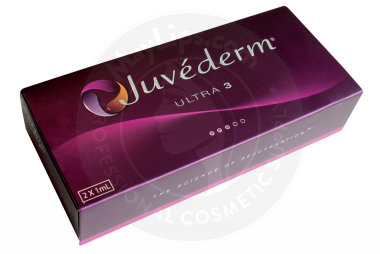 Juvederm Ultra 3 is a thick and versatile gel consisting of hyaluronic acid, which helps to correct many skin issues. If your patients suffer from moderate to severe wrinkles, like marionette lines and nasolabial folds, and thin, undefined lips, they can use this gel. 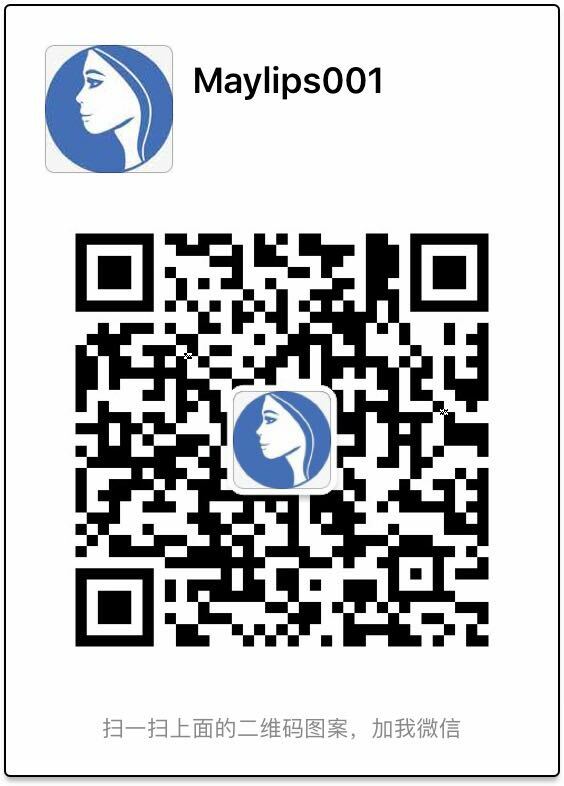 This cosmetic filler is also indicated for patients with facial fat loss with pronounced face hollows. Young skin generates new cells (e.g. collagen and hyaluronic acid) and repairs any injuries sustained with ease. This is why skin usually looks smooth and plump during the younger years. However, with time, the skin’s recovery process gets repressed, which result in lines and wrinkles. For some people, ageing signs can be harsh, especially when they lose facial fat deposits. The appearance of folds can then be exaggerated, resulting in a worn-down complexion. Juvederm Ultra 3 offers solutions for all of the above mentioned issues. The smooth filler gel is made of highly cross-linked hyaluronic acid to easily fill in the gaps underneath wrinkles and volumise hollowed areas. Once it is injected into the area, the body’s natural genesis of essential proteins is boosted. Hence, the face appears smoother and defined. How to inject Juvederm Ultra 3? 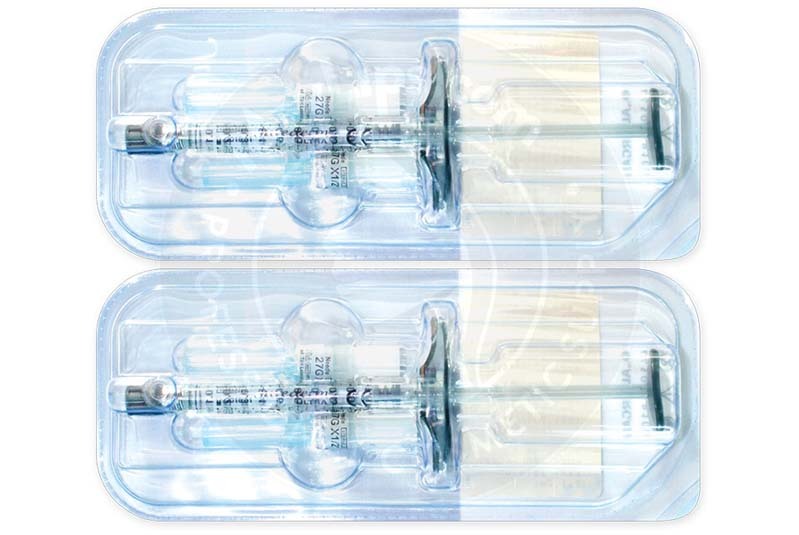 Since dermal filler injections are medical procedures, only certified medical personnel with adequate experience and skills in dermal filler injection techniques can administer this gel. Prior to injecting, do a thorough facial assessment session to identify patients’ skin concerns. During this session, you should also obtain their medical history (e.g. past and/or present medical conditions, medications and/or supplements taken, and previous dermal treatments) to minimise risk of adverse effects. After thorough cleaning and sterilisation, doctors should inject the gel into the dermis. If you are correcting the lip area, then inject the gel into the lip mucous membrane. The supplied needle and lidocaine ensures an almost pain-free treatment session. After injecting, discard the used syringe safely and gently massage the treated area for better product distribution. After the initial injection site reactions have subsided, patients will notice natural-looking improvements to their once-troubling skin issues. These improvements can last up to a year, after which the filler gel will gradually disintegrate into the facial tissues. Your patients can then get another treatment to maintain their youthful complexion. Individuals with active skin inflammations (e.g. herpes breakouts and acne); Individuals with a history of anaphylactic shock. If your patients are currently experiencing any skin irritations due to previous aesthetic treatments (e.g. dermabrasion or laser treatment), wait until the skin has healed before you proceed with Juvederm Ultra 3 injections. Some common side effects that your patients may report are actually associated with filler implantation. Usually, the above mentioned reactions last up to a few days and the full rehabilitation does not take more than a week. Patients should stop taking anticoagulants (e.g. aspirin, warfarin, high doses of vitamin E, fish oil, ginkgo biloba, or garlic) to reduce the risk of bleeding during injection and formation of haematomas at the injection sites. As well, patients should avoid alcoholic drinks, vigorous exercise, and extended sun exposure during the first 24 hours following treatment session. Other more severe adverse reactions may also happen if proper precautions are not followed diligently. Your patients should see a doctor quickly if the reactions persist longer than a week. 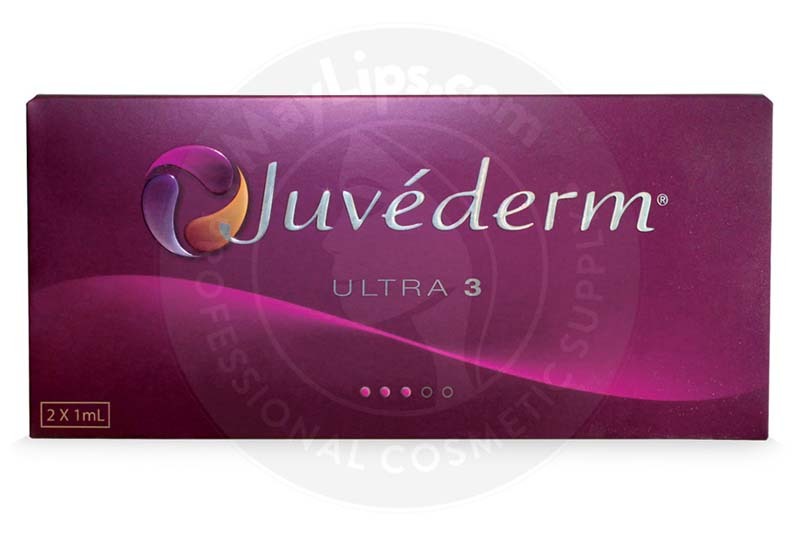 Juvederm Ultra 3 is made of non-animal highly cross-linked hyaluronic acid. The combination of lidocaine numbs the area during treatment. Ingredients: Hyaluronic acid gel (24 mg/mL). Lidocaine hydrochloride (3 mg/mL). Also Included: For each syringe, its box contains one sterile 27G1/2” needle. Package insert. A set of labels in order to ensure traceability.